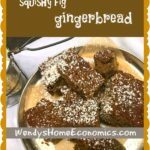 Squishy Fig Gingerbread… oooh la LA! It’s no new news that I’m not the baker. I can do it when need be, but all that chemistry of proper measurements annoys me… I’m not particularly into tedium, and I much prefer concocting stuff where the final successful outcome isn’t determined by improper measurement of a bit of this or that. When I was recently gifted with a bunch of sweet ripe figs, I said “self, what SHALL we do with all these here figs?” Of course, I could throw together some quick and simple preserves. I’ve got that covered. But dang, look at all those figs still in that bowl (aside from those I’m throwing in my mouth while pondering). 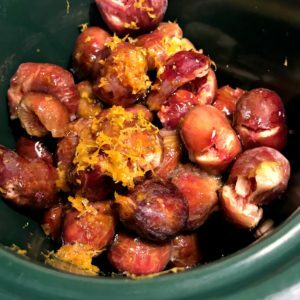 So, first thing I did was to fill up my mini crock pot (I adore that thing) with figs, squishing with my fingers as I threw them in. NOTE: Squishing is an accepted cooking term and process, at least in my kitchen. You squish when you want to break up whatever ’tis you’re working with, but still want to keep pieces in tact, mostly for the texture. So once I had my little crock filled with squished figs, I drizzled in some honey, a squeeze of 1/2 an orange and a little orange zest. I didn’t put much honey, because the figs were perfectly ripe and fully sweet all by themselves. I turned my little gadget on “high” and in a few hours, had…. fig preserves! I only made a small batch so I didn’t go through all the processing… and made a few batches of this to share. Trader Joe’s Raisin Rosemary Crisps! My favorite way to enjoy fig preserves is with cheese! If you have never savored fig preserves on some good salty cheese… or in my case, my FAVE Cambozola Cheese, well, you just haven’t lived! My family loves this too, and it’s always on our Christmas “nibbly” table. 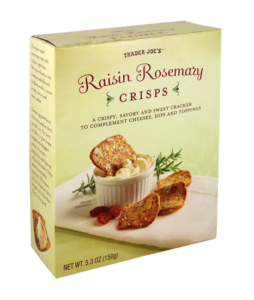 We particularly love this on these Trader Joe’s Raisin Rosemary Crackers! That weekend, some friends invited me over, so i took a little nibble…. 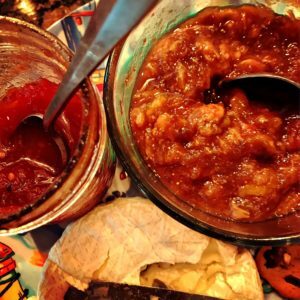 some cambozola with some fruited crackers, my tomato jam and these freshly made fig preserves…. most there had never had such a combination and loved it. AND, the ones that “don’t like blue cheese” really liked this creamy Gorgonzola blue/Camembert combination cheese too. Another way I love these preserves is in a grilled bacon and Swiss cheese sandwich…. 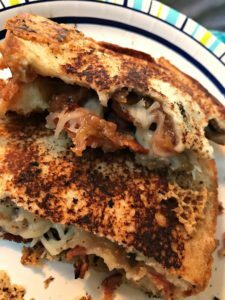 Grilled Swiss Cheese & Bacon Sandwich with Fig Preserves…. OK…. so let me get back on track and tell you about my gingerbread. I had had gingerbread on my brain for a few days and suddenly, the thought of combining moist sweet figs into rich gingerbread seemed like something to do… or at least ATTEMPT to do. I pulled out an old recipe I had and went to tweaking… having no idea what would happen! I was really hoping for success so I could spring a tasty baked goodie recipe on all those who know me as “the NON-baker,” self included. I’m so tickled to report that… IMO, success has been achieved! I declare, this gingerbread is da’bomb and exactly what was in my head when I embarked on this culinary cooking adventure. I do hope before the figs are all gone, you will give this recipe a try, and come back here and tell me what you think…. did you like it? did you tweak it? So since I have 11 new recipes I must get to in the kitchen and create for publication deadline, (but let myself get diverted to this post)…. here you go! I hope you enjoy as much as I have… I even wrapped up some of the bars and threw in my freezer to enjoy after all the figs are gone this year! Note: This recipe was created using Savory Spice Shop Raleigh spices! Looking for a new way to enjoy all those ripe figs? Here you go... my squishy fig gingerbread! 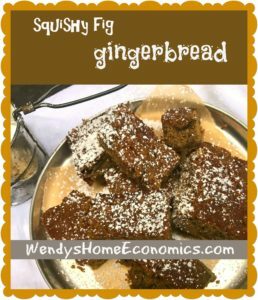 The figs make this gingerbread sooooo moist and a bit "gooey" too. A dusting of powdered sugar and you're good to go. Cut into bites, bars.... or enjoy a slab if that suits your fancy. Preheat oven to 350. Grease a 13x9 baking dish. Using mixer, gently combine eggs, sugar, molasses, coconut oil and extracts until blended. Combine dry ingredients in a bowl. Mix into wet ingredients a little at the time until well incorporated. Using spatula, fold in squished figs.Pour into baking dish. Bake for about 30 minutes, until the surface starts showing cracks. Let cool, slice and sprinkle with powdered sugar. I know, I got you with BACON dust, right? Well then let’s add Cheerwine to the party too! 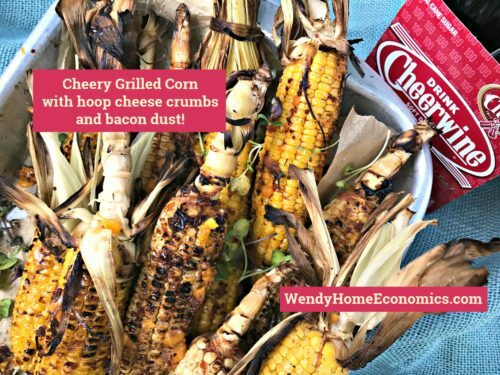 Bacon doth make everything more better, and on my “Cheer”y grilled corn is no exception. We’ve all seen the “same old same old” grilled corn recipes…. usually Mexican in nature. 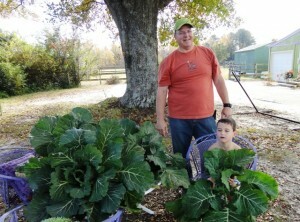 Well y’all know this southern gal is an evangelical when it comes to preaching that we should all cook and eat local. And around here, it’s North Carolina goodies, but the same applies wherever your “local” might be. Local and nekkid…. the way God gave it to us! 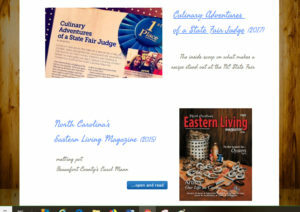 So when it was decided I’d do something featuring sweet North Carolina corn for the July issue of Carolina Country magazine, my little brain went to spinning…. because I do love some grilled roasted toasty corn. But I wanted to give it some good old North Carolina pizzazz, and when I opened my fridge and pantry to find my inspiration…. there it was, glistening in my face…. CHEERWINE! So then, I needed cheese. I grew up loving hoop cheese. 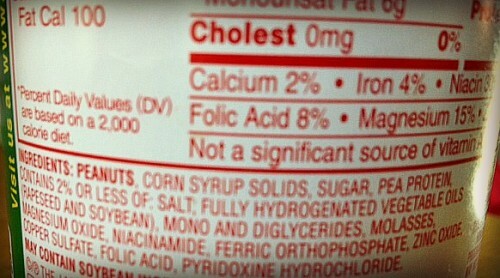 My mama, rest her soul, was no cook and made no bones about it. I can count on both hands (actually more like one) the cooking memories I have of her. 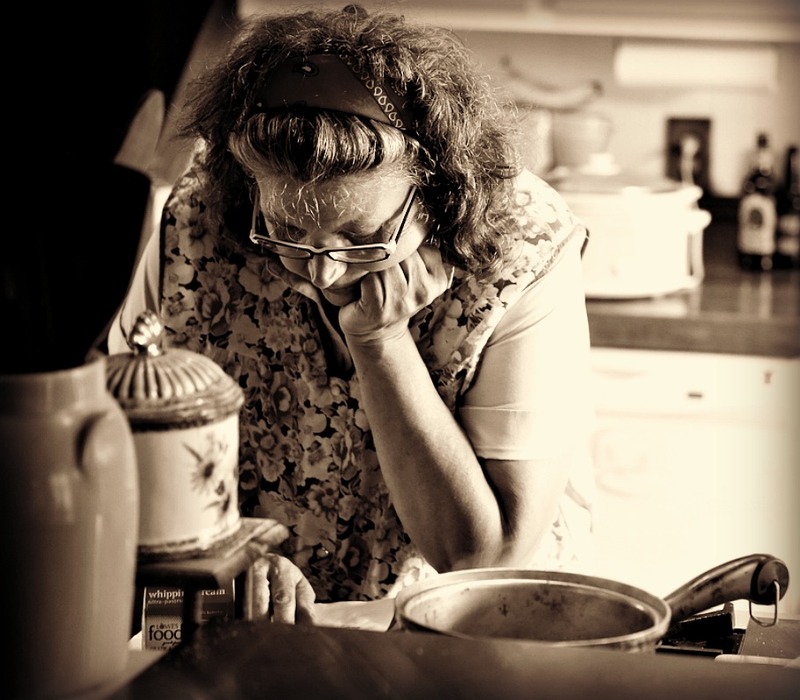 But one of those that I vividly remember was the nights she would take out her well seasoned 10″ cast iron skillet (I’m sure my grandma gave her to be a 60’s housewife!) and melt hoop cheese daddy had brought home from the little family-owned downtown Zebulon grocery store up the street from First Federal Savings and Loan where he worked. That hunk of bright orange cheese, with its cherry red rind, would be wrapped in “freezer locker” paper. 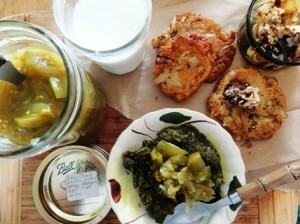 While mama’s canned biscuits were burning in the oven (she cooked everything on HIGH or 500…. no other settings were needed on our appliances! 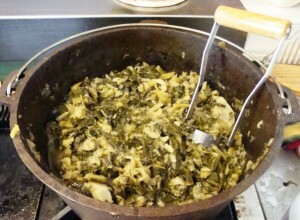 ), she was melting that greasy gooey hoop cheese in that skillet. I really don’t even recall having anything “on the side” with those cheese biscuits… and adding a side dish might have sent mama into culinary panic and running for the hills! So cheese biscuits it was. A “Menia supper” in all its glory. OK…. let’s hop off memory lane and get back to this corn thing! I know hoop cheese crumbles nicely, so keeping with my local and southern recipe and ingredients, Ashe County Hoop Cheese would be the perfect cheese to crumble and throw on the hot corn off the grill. I can pick that up at the Raleigh State Farmers’ Market, but if that’s not convenient for you, many grocery stores carry hoop cheese, and you’ll likely find it sold down the road in your local country store with saltine crackers…. if you are fortunate enough to live out in the country! But my corn needed one little something else. And naturally, I concluded that should and must be…. B.A.C.O.N.! Bacon Dust! So once I had all of this new concoction in my head, I could hardly wait to make it. 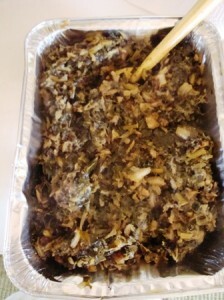 With plans at the beach with the family that coming weekend for a mess of steamed crab legs, I knew testing my new recipe with that crowd that would be perfect, one of my gaggles of guinea pigs… and what’s better alongside crab legs than corn? Well turns out my first trial run was perfect and didn’t need any tweaking. (A recipe developer loves it when that happens!) Lips were smack’n and fingers were being licked…. 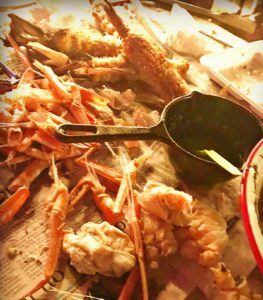 and nothing was left but a big old pile of gnawed off corn cobs and demolished crab shells…. Remnants of happy time and happy bellies! So I’ll leave you at that… and wish you and yours a fun and safe and most blessed July 4th! I do hope this week or sometime soon while corn is plentiful you will give this recipe a try. And if you do, come back and tell me what your crowd thunk about it! I’m pretty darn sure you will be the hostess with the mostess and be crowned “best corn” winner. 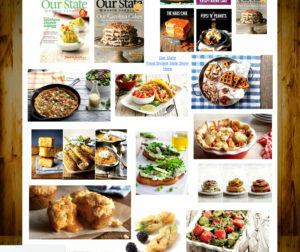 And while here, don’t forget to subscribe so you don’t miss more local goodie recipes to come! 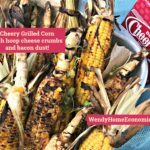 To celebrate Cheerwine’s 100th Birthday in 2017, fire up the grill and cook your crowd this Southern version of roasted summer corn on the cob! It’s so good you’ll want to plan at least two ears per guest. 12 ounce package bacon cooked and crumbled into "dust"
Heat gas or charcoal grill to high heat. While grill is getting hot, combine Cheerwine, molasses, mustard and butter in heavy bottomed saucepan. Bring to a boil then reduce to low boil and cook until sauce has reduced to about half, making a thickened glaze. Remove from heat and whisk in sage. Put corn onto hot grill, baste with glaze and cover. Turn every 1–2 minutes, basting as you turn, until charred in spots (about 8–10 minutes). 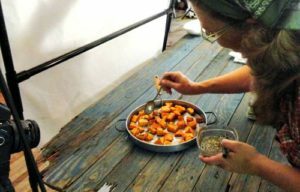 Remove to platter and while hot, scatter with cheese crumbles and bacon dust. Drizzle with any remaining glaze. Serve immediately. Pantry Purge has its rewards… NEKKID nut butter! During our most recent snow “event” last week, cabin fever set in. So instead of being lazy like I did in the storm 2 weeks before, I hopped up off my buttkus and got productive around the house! I have an awesome pantry that from time to time, gets in total disarray. Little pantry devils come during the night and make the biggest mess you’ve ever seen. So last week, I had to get in there and fix the mess those little demons had made. I love nuts… and like to keep some in the truck for a quick snack when out and about…. keeps me out of those drive thru junk food places and they offer me a quick heaping of protein to tide me over till I’m home. So I end up with bits and pieces of this, that and the other kinds of nuts from assorted companies… mostly from friends here in North Carolina… like Baker’s, Mackey’s Ferry, Bertie County, American’s Best Nut Co and others. Since y’all know me to be a “throw cooker,” you know I threw all those nuts together. There were VA blistered nuts, some salted nuts and some not, a menagerie of almonds (skin on, sliced, slivered), cashews and dry roasted. So this morning, I threw them all into the food processor. As they whirled around, I drizzled in a little peanut oil. I also had a tidbit of local honey in a jar so I finished that off too, and drizzled that in while the nuts whirled about. Since some of the nuts were salted, I didn’t need to add more. I like creamy peanut butter and I also like it crunchy, so I pulsed mine to something kinda in-between the two. And that was that! I cleared out about 6 cans, jars and bags of bits and pieces of nuts along with that jar of honey that needed to be out of the way for a new jar. And what did I end up with? 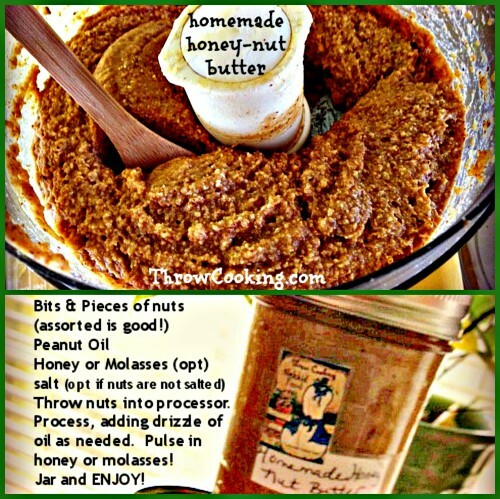 Three half-pint jars of the BEST NEKKID clean peanut butter… if you’ve never made your own nut butters, do! You’ll never go back to store bought again… you’ll have just plain, natural butter without all those chemicals, preservatives and SUGAR you buy at the store. 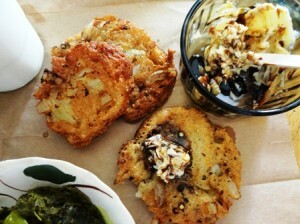 Here’s to pantry purging and reinventing goodies with all the tidbits of “stuff” you find in there. …crunch time ~ Let’s ROLL! Sunshine.Finally. Enough with this winter already. Here’s hoping we are on the back side of this one here in my neck of the woods…. Even my taste buds are in need of something fresh. It has been way too long since I’ve thrown together some of my egg rolls, and I’m longing for something crispy and crunchy. My inspiration for this came from one of the first cookbooks I was ever given decades ago. My uncle and aunt lived up in Michigan (might as well have been a foreign country back in the day when I was a little girl). Every year me, mama and my Ma Hocutt would fly up there to visit. They would take us to this “WEIRD” restaurant to eat food we’d never heard tell of… Chinese! It was years before I realized I like that kind of food, because they would order stuff for us they liked… like wonton soup (ewwwww). And Moo Goo Gai Pan (ewwww…too boring). But over time, as I tried new things, I loved it. So seeing blossoming cook that I was, they gifted me with a Chinese cookbook. I had mama help me find egg roll wrappers and that was all she wrote. I have made no telling how many of these over the years… mostly this recipe, but sometimes I’ve thrown in other fridge leftovers or tweaked a bit one way or the other. 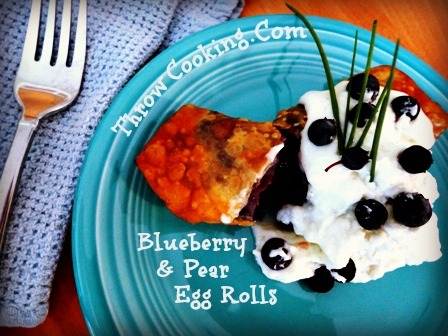 I love egg rolls and have made them from barbecue and slaw, to fruit filled ones like these blueberry ones below too. Friends beg me for these, and when having girls’ beach or river weekends, egg rolls are always on the menu… we even eat them cold for breakfast the next morning… IF there are any leftover. They are fun food… and who doesn’t like fun food? I have thrown together Duck Sauce from scratch and used store bought too. I’ve used peach chutney, peach preserves, made pineapple concoctions and apricot variations. So use whatever you can find or throw together your own. Just make egg rolls. They only appear to be intimidating… but are super easy to make, wrap and fry. Be creative with leftovers… Just open the fridge and see what you can find in there to throw together, wrap and cook! Blend soy sauce into the cornstarch. Whisk in water and molasses. Set aside. In wok (or large skillet), heat the oil over high heat. Stir in garlic and whirl around in the oil for 30 seconds. Add pork, cabbage, carrot and scallion. Cook about 3 minutes or until the vegetables are crisp-tender. Stir in shrimp.Scatter with sesame seed. Give the cornstarch mixture a stir and pour over the hot mixture. Stir just to glaze and thicken the filling. Set aside to cool before wrapping. To Wrap, place the wrappers with one of the corners pointing towards you. Spoon 2 tablespoons of filling across center of wrapper. Fold bottom corner over filling. Fold in each side and roll towards back corner. Brush edges with the egg wash.
Place on wax paper or foil with pan spray (to prevent sticking). Fry a few at the time in hot oil, making sure not to crowd. Keep warm on a cake cooling rack placed on baking pan in oven on low temperature until ready to serve! Heat oil and butter in large heavy skillet over medium heat. Once the pan is hot and butter is melted, add the pears and blueberries. After about 5 minutes, or when pears are tender but still have a little bite to them, stir in salt, jam, sugar, onion, apple pie spice and thyme. Cook about 3 minutes until sugar has melted and ingredients have married. Remove from heat and stir in pecans. Chill filling for several hours or overnight to thicken. While making the egg rolls, head lard in deep fryer to 375. Have an assembly line ready for filling and cooking egg rolls. You'll need wrappers, filling with slotted spoon and water-cornstarch slurry.Unless you are wrapping all in a short period of time, keep the wrappers covered with a damp cloth. ASSEMBLE: Lay a wrapper on clean dry surface such as wooden cutting board. With slotted spoon, scoop out and place about 1 heaping tablespoon of filling across bottom corner. Lift and roll the bottom corner over the filling until about halfway across the wrapper. Fold one side, then the other into the center. Keep dipping your fingers into the cornstarch slurry to dampen and seal the wrapper. 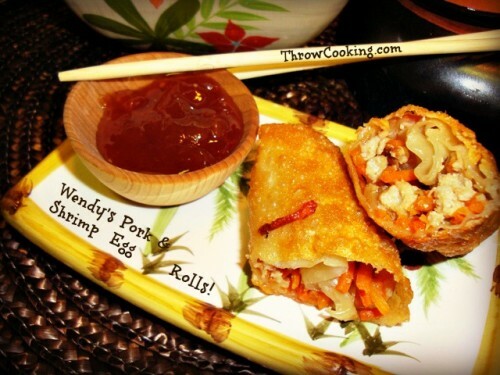 This helps hold it together for a tight roll to keep your egg roll from getting oily inside. Lay on oil sprayed wax paper or foil. COOK: Gently add rolls into heated oil making sure not to crowd in the oil. Fry until browned and crispy, about 2-3 minutes. Remove with tongs onto raised rack lined with paper towels. Make sure oil has returned to 375 in-between batches before adding more egg rolls. If the oil is not hot enough, you will have soggy rolls. Keep warm on pan in oven until ready to serve. SAVORY WHIPPED CREAM: Using mixer, whip cream until stiff, adding sugar a tablespoon at the time starting about halfway through whipping. Add the cream cheese a tablespoon at the time and whip into cream. Keep chilled until serving. SERVING: Place warm egg roll onto dessert plate. Add a dollop of Savory Whipped Cream... and dig in!